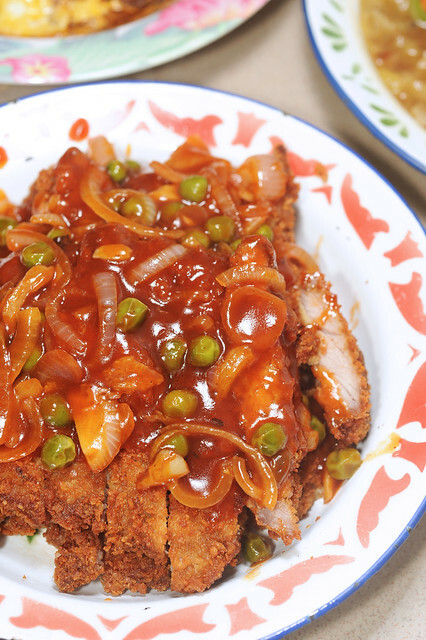 海南炸猪排 Hainanese Deep Fried Pork Chops is another dish that sends me right back to my childhood. My mum prepared a version of this fairly frequently when I was young, because my sister and I, as children loved fried food! I remember vividly how I used to help my mother tumbuk i.e. pound cream crackers using our old mortar and pestle on the floor laid with a layer of old newspapers beside the kitchen sink as my mother washed and chopped ingredients for other dishes. The sweet and tangy flavours from this dish are most remarkable, and all the more memorable. Well, we are not of Hainanese descent, so truth be told, I’m not sure where and from whom my mother learnt this dish from. Was it from one of the zup chai png stalls in Chinatown? Or was it from the famous Hainanese curry rice stall that opened only during the wee hours of the morning near Kovan? Being the clever woman she was, this was definitely well within her means to have reverse-engineered it. 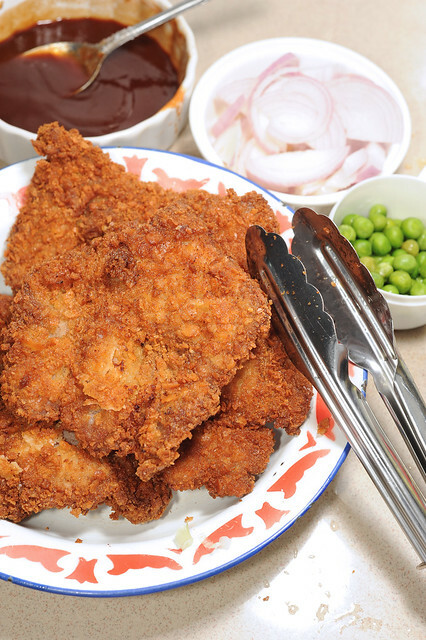 But one thing remained certain till this very day, my mother’s Hainanese Deep Fried Pork Chops were simply delish!!! 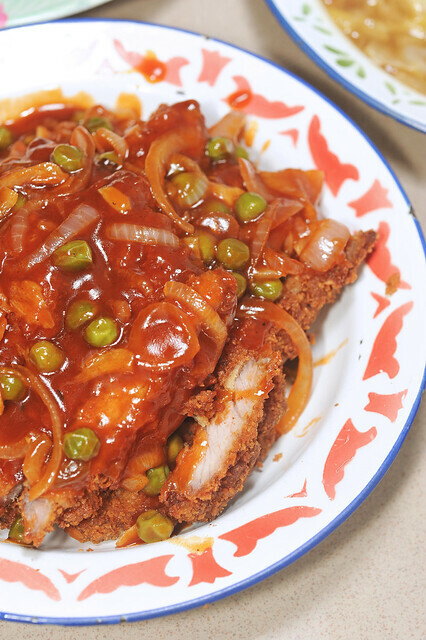 Despite its name 海南炸猪排 Hainanese Deep Fried Pork Chops is not a dish from authentic Hainanese cuisine, i.e. one would never find it served in restaurants on Hainan Island. It is a colloquialised concoction, (almost) uniquely Singapore I’m sure. Back in the founding days, many of our migrant forebears, i.e. 新客 sinkehs as they were known, had specific areas of expertise and profession. Just like how the rickshaw pullers were predominantly helmed by the Heng Hwas and the Hock Chias, while most pawnshops and Chinese traditional medical halls were opened by the Hakkas, the Hainanese who came to Singapore were known to serve as cooks in the private homes and dormitories of the British colonial masters. Many of them also worked in the kitchens of well-to-do Peranakan families, where they were “conferred” the title of “chong po“, a probable form of 總鋪師 zong po sai, which means head chef in Hokkien, the Chinese dialect which was very heavily borrowed into the Peranankan patois, Baba Malay as what we know today. The Hainanese chong pos, revered for their remarkable culinary skills were assigned the tasks of whipping up all those wonderful delicacies served during a Tok Panjang, the Peranakan long table feast. While many of these “new dishes”, be it Bak Kut Teh or Rickshaw Noodles were improvisations and innovations by the sinkehs largely meant for themselves, Hainanese Deep Fried Pork Chops was a dish prepared by the Hainanese cooks for their British employers. Through the marriage of flavours from condiments found in Western cuisine, with the spices and pastes characteristic of the Orient, this dish must surely be one of the very first “East-West fusion” dishes ever concocted. Many of these Hainanese cooks who’d saved up sufficiently, became entrepreneurial later and set up their own F&B businesses, opening coffeeshops and confectioneries selling Hainanese kaya on toast, Hainanese curry rice and of course Hainanese Deep Fried Pork Chops. That was probably how the dish got introduced and popularised amongst the masses later on, and also probably where my mother had her first taste of it. Partially break down the fibrous tissues of the meat slices by pounding them with a meat mallet or the blunt reverse side of a chopper/cleaver. Transfer pork slices into a bowl, add all the stated marinating ingredients onto the pork slices and rub them thoroughly over the meat ensuring that every piece is well coated. Cover bowl with cling film and set aside for at least 1 hour in the fridge. The longer the marinating time the better. Up to 6 hours. 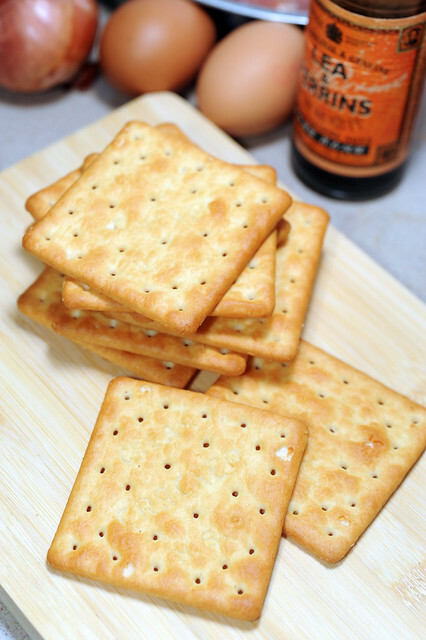 Meanwhile, process cream crackers into crumbs by either pounding using mortar and pestle, or simply pulse blitzing them in a food processor for a couple of seconds. It could also be done by placing the crackers into a food-grade disposable bag and break up into crumbs using the blunt reverse side of a chinese cleaver, or the bottom of its handle. Transfer cracker crumbs onto a shallow dish and set aside. To deep-fry the pork slices, crack two eggs into a shallow dish and gently whisk to amalgamate the yolks and whites. Heat wok until it begins to smoke and pour sufficient vegetable oil into a wok to be able to completely submerge the pork slices. Test the temperature of the oil by dropping a few piece of cracker crumbs into it. 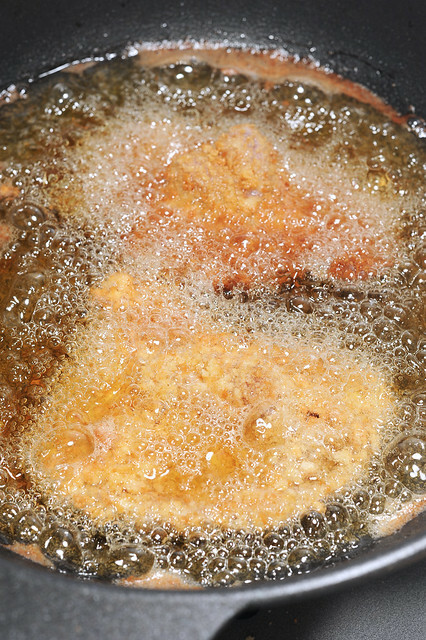 When the oil is ready, the crumbs should begin to sizzle on the sides and stay afloat. Coat marinated pork slices generously with egg wash and then cracker crumbs. 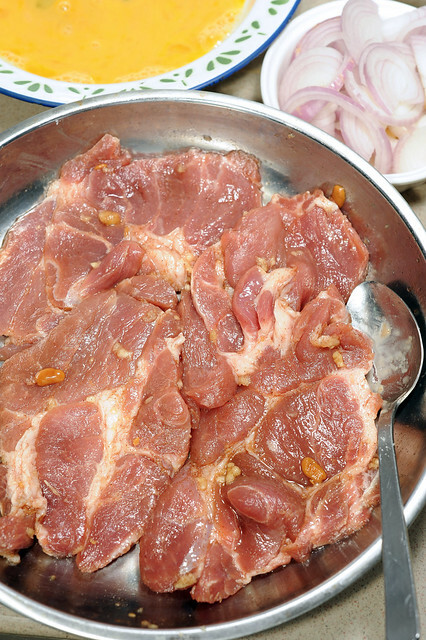 Gently slide pork slices into wok of hot oil ensuring that the slices are completely submerge. Repeat for the rest of the pork slices. Remove when they begin to turn golden brown and drain over wire sieve and kitchen towel. 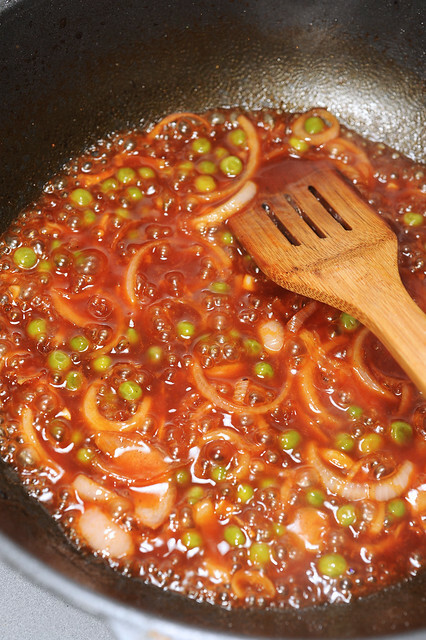 Transfer frying oil into a container and give the wok a quick rinse to remove any crumb debris. Heat wok til hot and add onion slices and minced garlic. Stir fry until they soften and exude aroma. Add mixed vegetables and continue to stir fry for a while. Pour drizzling sauce concoction over vegetables and bring to a boil. Bring heat down to medium low and drizzle in starch mixture while stirring continuously until the sauce thickens to the desired consistency. Chop pork slices into thick strips and arrange them onto a plate. Gently drizzle sauce ingredients over pork chop and serve immediately. The mixture of eastern (five spice powder and bean paste) with the western (A1 steak sauce and worcestershire sauce) elements worked really very well. This is the “bastardised” version of another quintessential Cantonese dish 咕噜肉 Sweet and Sour Pork, as well as 糖醋排骨 Sweet and Sour Pork Ribs from Zhe cuisine (浙菜) which are immensely popular as well. Despite all of these to be variations of the same theme, subtle nuances in flavours distinguish each of them from the others. The vegetables used to top the pork slices can vary, from the use of just green peas, or petit pois as the Englishmen would had known them, to the trio of peas, diced carrots and corn kernels as we find commonly in the frozen food sections in supermakets. Deep fried cubes of russet potatoes could also be added to make this dish more “wholesome” but this has to be done before deep frying the pork slices as the floating bits of burnt crumbs and debris would “disfigure” the potato if the frying order was reversed. It is customary to use soda cream cracker crumbs for coat, rather than breadcrumbs or panko. The buttery flavours from the crackers provide a lovely dimension to the pork. 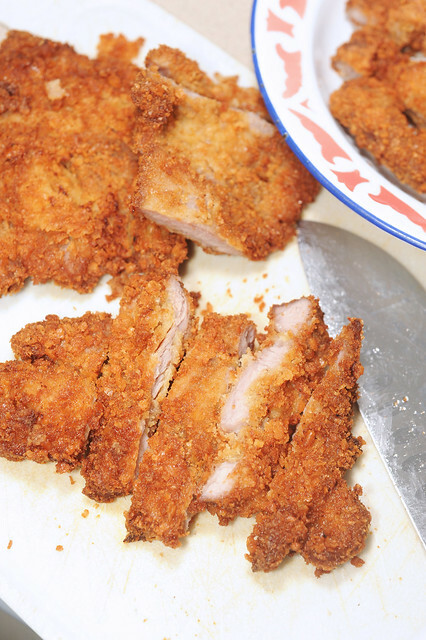 While ensuring that the pork slices are well-coated with crumbs, do not attempt to press down the crumb layer too hard as it would make the coating too compact and void the dish of its fluffy crisp textures later. Also, do not blitz the crumbs too finely which would also likewise impair the textures of the pork slices after deep frying. If necessary, deep fry all the pork slices over two or three batches to avoid overcrowding the wok. This makes them easy to manuvoeur and turn in the work as well as to prevent the oil temperature from dropping too much by introducing too much ingredients into the oil all at once. The concoction of sauce ingredients only serve as a guide. The abovestated mixture works well for my palate but can be tweaked if necessary to suit yours. But the basic assembly of condiments should remain more or less unchanged for a more authentic Hainanese Pork Chops experience! This entry was posted on July 11, 2012 by Alan (travellingfoodies). It was filed under Food, Simple Eats and was tagged with A1 steak sauce, chong po, dialectal cuisine, green peas, hainanese pork chops, ketchup, onion, Peranakan, pork chop, worchester sauce, 海南炸猪排. Alan I am drooling right now and can only do an imaginary meal with this. Yum. Hahaha Edith, make some and go for the real deal!!! cool! let me know how the recipe works out for you! The sauce is what makes it hainanese? Hi there, FoodieFC. Its not really the sauce but rather the folks who concocted this dish eons ago…. the version we have here is very different. No bean paste, heavily 5-spiced, thin pork loin, and coated with fluffily beaten eggs that bubbles as it fries. The gravy is also much thinner..
Hi Alan , My in laws are hainanese and the pork chop is almost the same as yours but they have add sour plum sauce to the tomatoe sauce . ah yes! thanks for the suggestion! plum sauce would definitely make it really appetising!